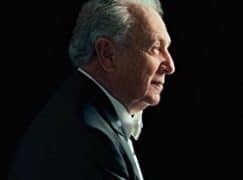 The legendary Anshel Brusilow, concertmaster of the Cleveland Orchestra under George Szell and of the Philadelphia with Eugene Ormandy, died last night at the age of 89. After clashing with music directors, he lit out to Texas, where he became both executive director and conductor of the Dallas Symphony. He recorded extensively as both violinist and conductor. In recent years, he published a slam-bam memoir titled Shoot the Conductor. He was a formidable musician, and a formative one. He was a great friend and one of the finest musicians I have ever known. It’s a shame Brusilow’s Chamber Symphony of Philadelphia recordings have vanished. I also had the Brahms Serenade and still have their LP of the Arensky Tchaikovsky Variations and Tchaikovsky’s “Mozartiana” Suite. Still my favorite recording of the Tchaikovsky. He did a great job in the 90s with the University of North Texas orchestra. They sounded first rate. I was at UNT in the late 70s, and he had our orchestra sounding great then, too. Had a lot of respect for what Josef Gingold did as concertmaster with the NBC Symphony, but Brusilow was always nice to hear in the Ormandys. Philly in those days was also a nice counterweight to Chicago (if without the “Living Stereo”). Gingold was not first concertmaster of the NBC SO. He was third chair cq 2nd concertmaster. The two first places were occupied by Mischa Mishakoff as concertmaster and Daniel Guilet ( co- principal.) Brusilow was a great player. Very good” Bürger als Edelmann” on disc and of course Heldenleben and Zarathustra under Ormandy…. Yes, Mischa Mischakoff was the concertmaster of the NBC. Daniel Guilet was fourth chair, Remo Bolognini was third chair. Often Max Hollander (among others) was Mischa’s partner. Gingold was a member of the orchestra, but he was never concertmaster, as far as I know. All the beautiful violin solos were played by Mr. Mischakoff. Oscar Shumsky was at times Bolognini’s stand mate. We will miss Maestro Brusilow greatly as a musician and a man. BDE, may his memory be a blessing. Brusilow’s solos in Ormandy’s Scheherazade and Heldenleben are absolutely wonderful. He was assistant in Cleveland from 55-57 and associate from 57-59. I have read an account of him going to Szell insisting he, not Mr.Gingold, should be concertmaster. If you listen to his recording of the Sarasate Introduction and Tarantella with Ormandy you would easily be convinced that he deserved to be concertmaster in Cleveland. However he may not have had the extraordinary people skills which Gingold possessed….. I think you are being overly charitable by qualifying your statement with respect to his people skills vis-a-vis Gingold. I’ve also read that within a year or so of joining The PO he let it be known that he not Ormandy should be leading the orchestra and went so far as to create a chamber orchestra composed of colleagues. Nonetheless, a greatly admired player. ……………..the creation of the Chamber Orchestra not supported or appreciated by Mr. Ormandy according to the book. The book is very readable and enjoyable btw. Anshel was concertmaster of the Philadelphia Orchestra when I worked as assistant to the librarian in the 1960s. I was in Eugene Ormandy’s office at 10 one morning when Zino Francescatti cancelled his 2 p.m. appearance because of illness. Ormandy called Anshel. “Can you play the Tchaikovsky this afternoon?” Ormandy asked. On four hours’ notice, Anshel gave a thrillingly beautiful performance. I had become close to the orchestra when I was a teenager, and the players were my surrogate family. I will never forget the loving kindness and attention I received from the musicians, particularly Anshel. I spoke with him only last week and told him what his friendship over all these years has meant to me. He sounded upbeat, saying that hoped to make it to the next New Year’s. I wish he had been right. He was a lot of fun and heck of a great Softball Coach too!!! On baseball. For a time during the 1950s, Anshel and Marilyn lived across the road from us. He played at the St. John Terrill Music Circus in Lambertville, N.J. A regular patron of the Circus was the postal clerk at the Bryn Athyn, Pa. post office where he got his mail. One October morning when he came in for his mail, she (the clerk) asked if he was all right. During the previous day’s performance she had seen him bending over during rests as if he might have had some discomfort, then speaking to the player next to him. Anshel replied, “Oh no, there was nothing wrong.” Seems that he had a portable radio and during the rests, was listening to the World Series, then passing the plays and score on to the other players. His book is wonderful, too, though there are a few factual errors –such as stating that Zubin Mehta immediately followed Lenny B at the Philharmonic. It was, of course, Boulez, then Mehta. He stressed that while Ormandy was not a glamour-puss and was not quite a top-notch conductor, he did have his strengths, namely, rescuing some desperate situations leading into and during concerts. I studied conducting with him, but as a composer he also was a real champion and inspiration. He premiered my first orchestra piece “In the Upper Room” while I was a student at UNT, and second work with the Richardson Symphony. When applying for my current job on the faculty at SMU, he had me over and gave me advice that still rings true in my ears today. Not only a great conductor, but incredible teacher, mentor, and blunt, tell-it-like-it-is encourager of young musicians. There are so many of us who carry with us his spirit and wisdom… Rest in Peace. Oscar Shumsky was another huge talent who was denied the measure of fame he deserved. Unfortunately, that seems to be the norm in this country. For every greatly successful musician, there are others in the shadows who are much greater. Brusilow states in his book that he didn’t shake the hand of a guest violin soloist who had supported the Nazis, but B. doesn’t give the violinist’s name. Does anyone know who it was?